When it comes to family dinner, unanimity of approval is the dream. Over the past few years, we’ve developed a pretty solid rotation of meals – shrimp with feta, pork chops, grilled cheese — that achieve something close to 100% satisfaction around the table, that elicit not a squeak of protest when plate hits table. But that rotation, like the diamond-crusted roster of the New York Yankees, is in constant need of refurbishing and reinvention. Move forward or perish, right? We’re always trying to introduce new things that we can come back to again and again, things that taste a little better that what we ate last night, or are a little more heart healthy, or a little easier to make. Here’s the problem with introducing something new: most of the time, at least one of the kids won’t touch it. But that’s okay! We have a theory around our house: If we can achieve 75% happiness with a new meal – that is, if 3 of the 4 people at our table eat the meal without complaining, crying, or vomiting – then that meal is worth making again. And the more we make it, the more likely our li’l holdout will be to try it, and once she tries it, the more likely she will be to come around eventually to, you know, liking it. And in this way, our dinner rotation expands. In large mixing bowl, combine chicken, scallions, ginger, lemon juice, paprika, cumin, cayenne, salt, and pepper. Cover and put in refrigerator for 45 minutes (this lets it all marinate, and also makes it easier to handle). Form into patties and grill (or fry in pan) until cooked through, about 6-7 minutes a side. (Make sure to oil the grill beforehand, as the burgers will stick.) 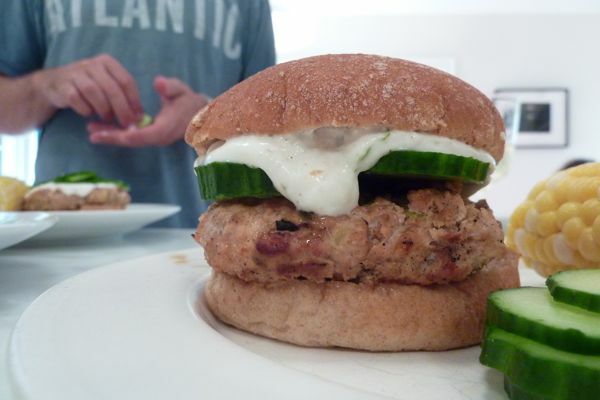 Serve on whole wheat buns, topped with lots of crunchy cucumber slices and yogurt sauce. For yogurt sauce: Whisk together 1 cup nonfat plain yogurt, 1 teaspoon cumin, 1 tablespoon chopped cilantro, 1 tablespoon lemon juice, couple pinches of sugar. Kids can be crazy…I would never not eat this. I love new spins on the old hamburger favorite! my kids also often will not eat “new” things. I feel like if they eat more than one “no thank you” bite it is a HIT! PS, We are making this on Sat. Grill night in ol peoria. Haha, I love that your husband didn’t like the meal! My father’s side of the family is off the boat Italian, and would prepare very “eclectic dishes” when I was growing up. The impending question was never if I would eat the meal served, but if my very waspy mother would. Cheers, and Happy Friday! Christine – Actually Andy was fine with the meal — he was the cook who chose it — it was my fickle six-year-old who rejected it…! I make these the other night and they where great! Instead of the cucumbers and yogurt sauce I used Trader Joe’s Tzatziki Cucumber Sauce. So good! Ground chicken can be way more expensive per pound than frozen chicken breasts, so at my house when we make chicken burgers I defrost frozen chicken breasts and run them though the food processor to make ground chicken. After some olive oil, seasonings, and bread crumbs, they’re ready for the grill. All white meat, at a significant cost savings. Thanks for your blog; it is required reading around here! I made this tonight and my husband ate two! So delish. The yogurt sauce was especially good. another winner — and I did grind my own chicken with the standard rotary blade in the food processor. Cheap, and these things were tasty. I may play with adding a bit of something — maybe a bit of cheese, or some pine nuts. But … a winner! “I read your newsletter. Do I win the Inmod Teak Bowl?” Thanks for sahring cant wait to make it for the family !!! These looks great! How many does this recipe make and can I marinate the meat over night? So glad you reminded me about this recipe in the newsletter! …and, not for nothin’, I LOVE your blog. My friend Jenny Goldstock-Wright turned me on to it. Thank you for your dedication. I love cucumbers and never thought to put slices on a bun like one would tomatoes or pickles. Now isn’t that silly that I couldn’t come up with that on my own? Thanks for the post!